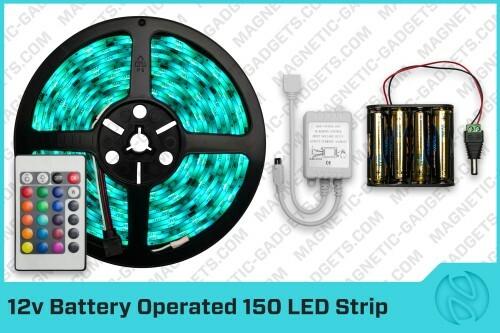 This Battery Powered RGB LED Strip is the ultimate portable LED Strip. You can now add a magic touch to any special event even if there’s no electrical outlet available. Battery operated LED Strips are great for Tradeshows, outdoor kiosks and any other non permanent location or activity. This battery powered LED strip is so light weight and compact that you can even incorporate it in clothes to make the ultimate Tron costume for Halloween or Santa for Christmas. This battery Operated LED strip includes a 12V power pack with 8 AA Alkaline batteries (included) that will provide over 6 hours of light. After 6 hours the strip will still work for about 4 hours but it won’t be as bright.